Today is Easter Sunday, so today I want to write about a cute little Easter bunny, the volcano rabbit. These cute little guys are one of the smallest species of rabbit, growing only about 32 cm long. They are have very unusual ears that are much smaller than other rabbits. 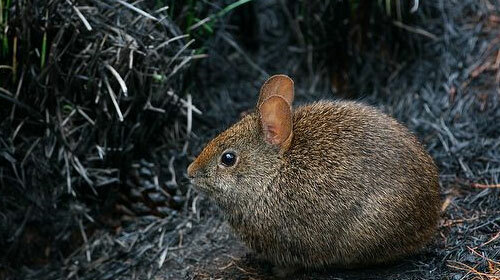 Volcano rabbits live in small groups of 2-5 animals, spending their time in burrows and long grass. Unlike most other rabbit species, they are very vocal and will shriek loudly when threatened to warn others. In the wet season, they eat mostly eat grass, but in the dry season, they eat woody plants such as shrubs and small trees. Volcano rabbits get their name from where they live. Their entire population of about 1,200 rabbits are confined to four volcanoes in Mexico. They are endangered and their numbers have dropped dramatically due to logging, livestock grazing, fire, road construction and hunting. Are there any other interesting facts that you would like to share about volcano rabbits?